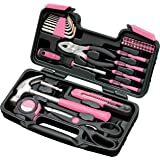 PROFESSIONAL QUALITY: The MasterTEC 88pc PINK ROLL-UP TOOL SET is built tough, built to last. Made from quality materials. For professional, industrial, home, hobby or craft use. 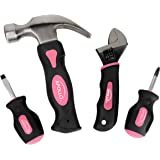 ESSENTIAL TOOLS: Kit includes the most popular had tools needed in any car, rv, office, home or shop, from a simple weekend project to a everyday hobbyist everyone needs a set of tools like this. SATISFACTION GUARANTEED: MasterTEC goal is simple, "GO THE EXTRA MILE AND EXCEED YOUR EXPECTATIONS". From the PROFESSIONAL TECHNICIAN using our tools daily, to the DO IT YOURSELF repair/hobby person, MasterTEC / AutoTEC tools won't let you down. First of all I'd like to mention I LOVE the case and how neatly everything is rolled up inside this case. 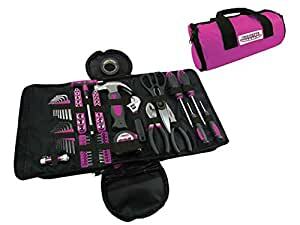 The fact that it's pink is awesome because my boys won't touch it (which means my tools won't come up missing). The downside is that the tools are cheap. I guess that's to be considered with a lower price. The first time I've used any of my screwdrivers, the finish on the outside came off and the silver part of the screwdriver started coming off with each turn. Pretty soon I'm wondering if I'll have any tip of the screwdrivers left. That said, for now they are working well. Got this for a friend of mine who's favorite color is pink. She absolutely LOVED it and I was impressed by the quality. I expected to be cheaply made and not really usable but I was completely wrong. It is actually a very nice tool set and quite colorful. 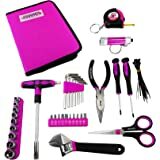 5.0 out of 5 starsNovice tool kit. Perfect little home tool kit for the novice. The multiple sized Allen wrenches have come in especially handy. It’s reasonably priced and of a decent quality. 4.0 out of 5 stars1st driver approved. Would have been perfect if the flash light and zipper on the bag weren’t broken. Plus the fact that the box it came in was crushed. My teenage daughter who is starting to drive lives that she has this in the car with her just in case.